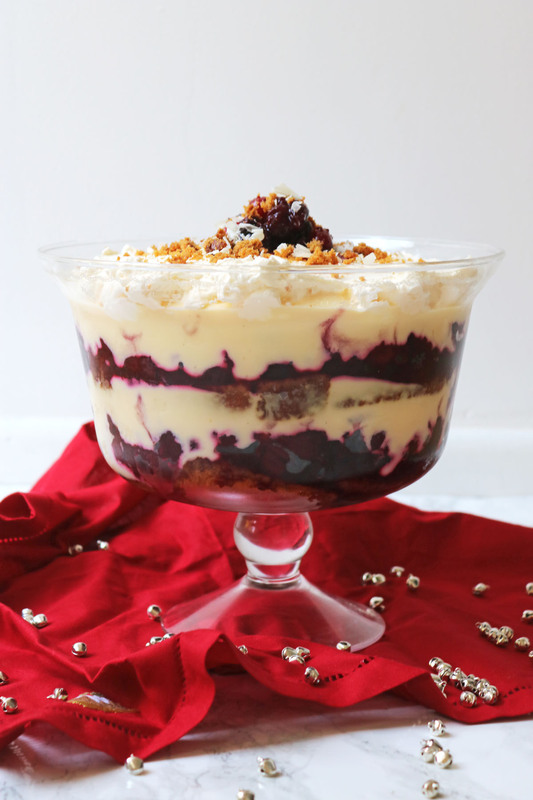 Celebrate sugar, spice and all things nice with this Winter Berry Trifle made with sticky ginger cake and white chocolate custard. I’ve written before about how, as a child, I wasn’t the biggest fan of trifle even though its one of the most quintessential English puddings. The turning point for me was realising just how easy it is to make custard from scratch and that it tastes ten times better than the bright yellow stuff that comes out of a packet. Since this discovery, I’ve been transforming the humble trifle into a real showstopping dessert. 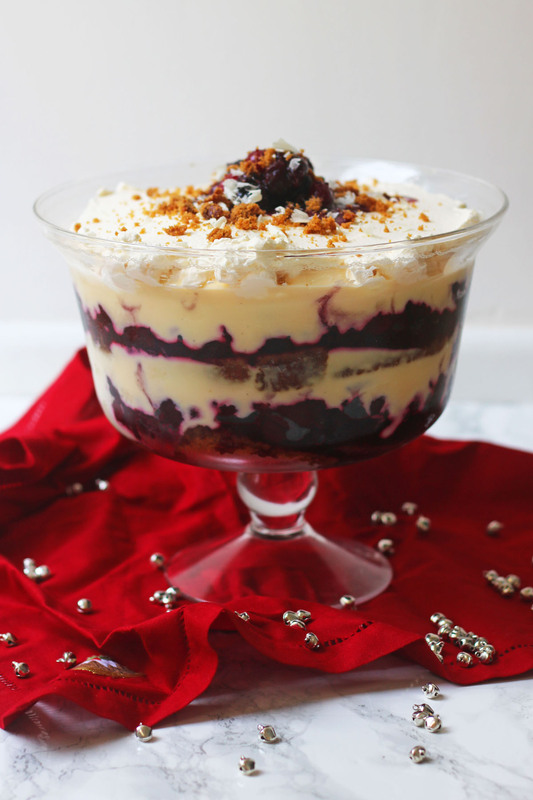 My first foray into trifle recipes was a simple Blackberry Trifle recipe back in 2015, quickly followed by a delicious Dark Chocolate, Orange and Ginger Trifle that Christmas. I’ve been making these recipes at almost every dinner party since, they are that good! My latest twist on the classic pudding isn’t quite as wacky as the other two. It’s got all the usual layers: cake; berries; custard and cream, but they’ve all been tweaked slightly to make a crowd pleasing winter dessert. Every trifle needs a good foundation – and that foundation is cake. Traditionally people use ladyfingers (thin sponge fingers that are crisp on the outside but soft in the middle). For this Winter Berry Trifle I’ve swapped ladyfingers for a dense, sweet and sticky ginger cake. If you’re planning on making everything from scratch, you can use my gingerbread loaf cake recipe, no need to make the cream cheese frosting. If you’d rather take a shortcut then I recommend McVities Jamaica Ginger Cake. The next layer is usually made up of fruit in the form of a liqueur, jelly and/or fresh fruit. I prefer not to put jelly in my trifles so I make a sticky, sweet berry compote instead. Because this is quite liquid, the juice of the compote soaks into the ginger cake meaning there is no need to soak them in alcohol first. 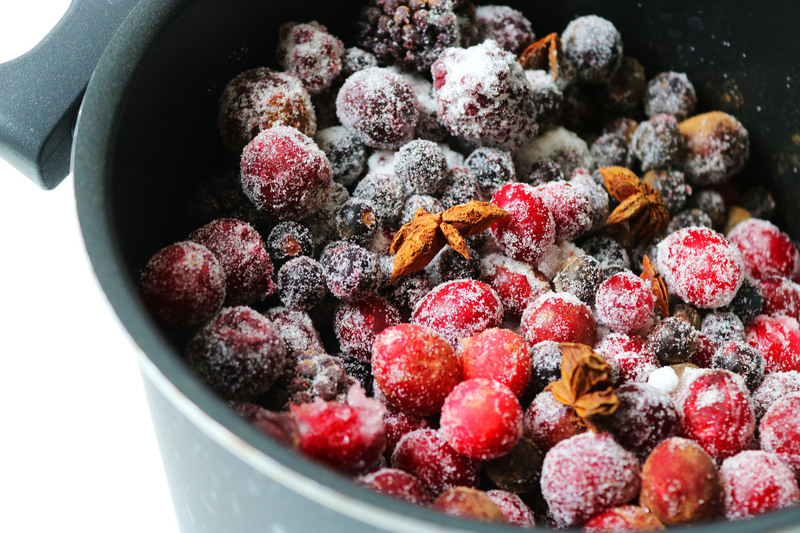 You can use any generic mix of winter berries. I like to make sure I have a good mix of cherries, blackberries, blackcurrants and (of course) cranberries! The berries can be quite sour so there is a fair amount of sugar in the compote. As well as sugar, I also spice the compote with cinnamon, a little more ginger and star anise. The third layer is my favourite. Double cream, milk, vanilla, egg yolks and white chocolate combine to made a velvety, luscious custard that balances the tartness of the compote and the spice of the ginger cake. Whatever you do, don’t be tempted to swap homemade custard for store bought. It will never be the same! I know that home made custard can be a little daunting but if you follow the recipe carefully it will come out perfectly every time and you will never look back. After repeating the cake, compote and custard layers a couple of times whipped cream is the perfect topping. I like to make my trifle a day in advance so that the layers have time to set together. The final whipped cream layer, however, doesn’t get added until the day before. Freshly whipped cream can be a little unstable so you won’t want to put it on the trifle until 15 minutes or so before you want to serve. If you do need to make it further in advance for any reason you can add 2-3 tablespoons of icing sugar to the cream before whipping. This will make the cream sweeter but it will also mean you can put the cream on top of the trifle hours before you dish it up. Most recently I topped the trifle with the sweetened whipped cream on the trifle at 11am and didn’t serve until 8pm. It was just as good as if I’d added the cream right at the last minute. Now you’ve got an understanding of the 4 layers that make up this pudding let’s get to making it! This festive, winter berry trifle is made with layers of sticky ginger cake, spiced berry compote, white chocolate custard and fluffy whipped cream. Place the berries, spices and sugar in a large heavy bottomed sauce pan with a splash of water. Heat gently until the fruits have thawed and stir gently to ensure the sugar, fruits and spices are well combined. Move to a medium heat and cook until the sugar has dissolved completely, the fruits have burst and you have a sticky berry compote (roughly 10 minutes). Take out the 5 star anise and allow the compote to cool. Place the egg yolks and the caster sugar into a large bowl and whisk for 2-3 minutes (by hand is fine) until the mixture becomes pale, thick and creamy. Pour the milk and cream into a heavy bottomed saucepan along with the seeds from the vanilla pod. Heat the milk and cream slowly until it comes to a boil (roughly 5 minutes) before turning the heat down to a simmer. Add a ladle of the hot milk/cream to the egg yolk and sugar mix and whisk quickly to make sure that it does not curdle. Add the rest of the milk/cream (a ladle at a time and ensuring it is mixed well) until all of the milk/cream has been combined with the sugar and eggs. Pour the mix back into the saucepan and cook over a medium heat for another 5 minutes until the custard begins to thicken and coats the back of your spoon. Add the white chocolate to the saucepan and stir until all of the chocolate has melted. The custard should now be thick and glossy (see note 1). Remove the custard from the heat and place to one side until completely cool. Before you can build the layers both the compote and custard must be completely cold. This can take an hour in the fridge or up to 2 hours at room temperature. Cut your ginger cakes into slices roughly 1 inch thick. Using just half of the ginger cake, cover the bottom of your trifle dish with the ginger cake. If using kirsch, drizzle half of this over the ginger cake. Next spoon over half of the compote followed by half of the white chocolate custard. Repeat with another layer of ginger cake, kirsch (if using), compote and then custard. Place into the fridge until half an hour before you are ready to serve. Pour the cream into a mixing bowl along with the icing sugar. Using an electric whisk, beat the cream until it is thick and soft enough to spread but still holds its shape. Spoon the cream over the trifle and level with a spatula. Top with any leftover compote, ginger cake crumbs or shavings of white chocolate. Note 1: how thick do you like your custard? I don't like my custard too thick and gelatinous. Following my instructions you will have a custard that is still a little runny and not set like a soft jelly. If you want a thicker custard just heat for a little longer until you've got your desired consistency. Don't forget to stir regularly to stop it sticking to the bottom of your pan or going lumpy. This sounds heavenly. What a great idea to use ginger cake to make it ideal for winter. I love a good Trifle and this looks and sounds like a Great One. My family is going to love this..
Yum! White chocolate custard sounds absolutely amazing! Yum. I want to try all these trifles now. They sound amazing! I love a good trifle. My mum always made a good trifle with cake and custard plus lot of fruits. This trifle looks superbly good and inviting. BTW just got back from London after a family holiday. It is beautiful during the holiday season. Okay, it has ginger cake, berries and homemade custard. And no dreaded jelly? Okay, I’m in Emma. It really sounds great with the tangy-sweet flavour palate. I made not one but two trifles this week but yours is much more impressive and traditional! I need to grab a giant spoon and dive right in! What a fantastic way of making trifle perfect for the winter season. LOVE the idea of ginger cake, and the white chocolate custard, and of course, the winter berries. All making me salivate! I’m so sorry it’s 4 egg yolks! I will update you the recipe as soon as I can!